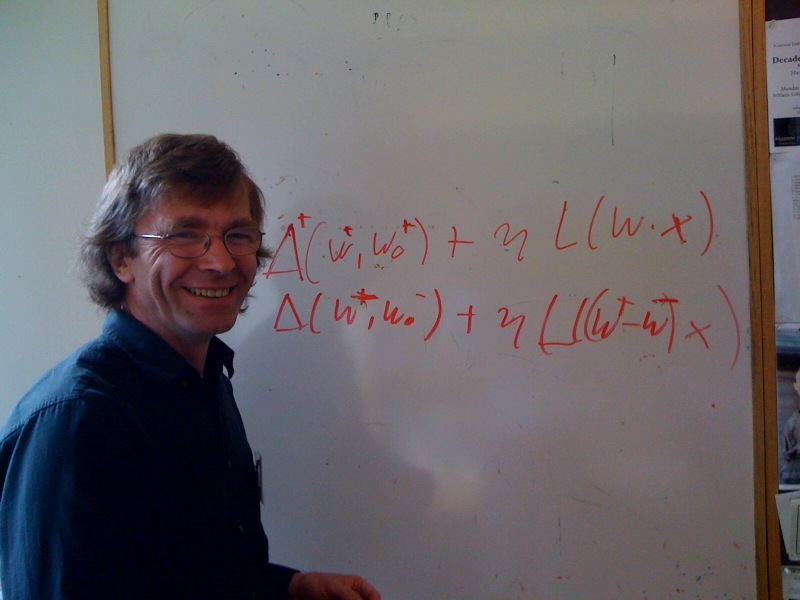 Today, I had the good fortune to spend time with Manfred Warmuth who is a leading scientist in Computational Learning Theory. ABSTRACT: Multiplicative updates multiply the parameters by nonnegative factors. These updates are motivated by a Maximum Entropy Principle and they are prevalent in evolutionary processes where the parameters are for example concentrations of species and the factors are survival rates. The simplest such update is Bayes rule and we give an in vitro selection algorithm for RNA strands that implements this rule in the test tube where each RNA strand represents a different model. In one liter of the RNA soup there are approximately 10^20 different strands and therefore this is a rather high-dimensional implementation of Bayes rule. We investigate multiplicative updates for the purpose of learning online while processing a stream of examples. The “blessing” of these updates is that they learn very fast because the good parameters grow exponentially. However their “curse” is that they learn too fast and wipe out parameters too quickly. We describe a number of methods developed in the realm of online learning that ameliorate the curse of these updates. The methods make the algorithm robust against data that changes over time and prevent the currently good parameters from taking over. We also discuss how the curse is circumvented by nature. Some of nature’s methods parallel the ones developed in Machine Learning, but nature also has some additional tricks. ABSTRACT: Artificial neural networks built from two-state neurons are powerful computational substrates, whose computational ability is well understood by analogy with statistical mechanics. In this work, we introduce similar analogies in the context of spiking neurons in a fixed time window, where excitatory and inhibitory inputs drawn from a Poisson distribution play the role of temperature. For single neurons with a "bandgap" between their inputs and the spike threshold, this temperature allows for stochastic spiking. By imposing a global inhibitory rhythm over the fixed time windows, we connect neurons into a network that exhibits synchronous, clock-like updating akin to neural networks. We implement a single-layer Boltzmann machine without learning to demonstrate our model. The National Institutes of Health awarded grants totaling $40 million over five years to map the human brain’s connections in high resolution. It is "an ambitious effort to map the neural pathways that underlie human brain function". Here is the website with more information. Dr. Horst Simon, our collaborator for "The Cat is Out of the Bag", was named as named Deputy Director of Lawrence Berkeley National Laboratory. See the news here. In related news, Horst Simon will also Chair the Gordon Bell Prize Award Committee.